Sail aboard the M.V. "Key Largo Princess" and view the exciting, beautiful, underwater world of John Pennekamp Coral Reef State Park, the only undersea park in the United States. The boat is a luxurious 70-foot, glass bottom, 129 passenger, twin-diesel, aluminum motor yacht. From the sun deck, on your way to the reefs, you will have a panoramic offshore view of the Florida Keys and the ever-changing colors of the ocean. If you prefer, you may ride inside, select a comfortable seat and enjoy the luxuries of the carpeted, air-conditioned salon. When you reach the reefs you will want to stand and look through the large viewing windows while your narrator tells of the wonders of the reef below. 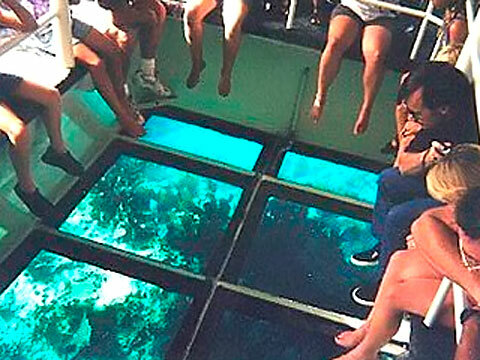 Totaling 280 square feet in area, the viewing windows are large enough for everyone to observe the reef simultaneously. your skipper will take you to the reefs where almost everything you see is alive: the reef itself, built of many varieties of living coral, teems with sea fans, sea plumes and hundreds of fish from small and colorful beyond description to the large species sought after by fishermen. Available, at our galley on the sun deck, is a variety of sandwiches, snack, soft drinks and adult beverages such as beer wine and mixed drinks. The Princess Is Located On U.S. Hwy 1 at mile marker 100 Holiday Inn Docks, Key Largo, Fl.